My husband and I have been together since we were 16. In our case, he was my high school sweetheart and I was more like his high school sassy. Being together so long has us so deeply connected. Sometimes, our connection is so in sync that I will be in the middle of texting him and the phone rings, bam! It’s him. Other times he knows exactly what I need … before I even know that I need it. I won’t fail to mention that we are fire on the dance floor because he knows that my moves haven’t changed in 15 years. Yet, after all of these years, the thing that brought our marriage to another level was when we started to really give back to others. 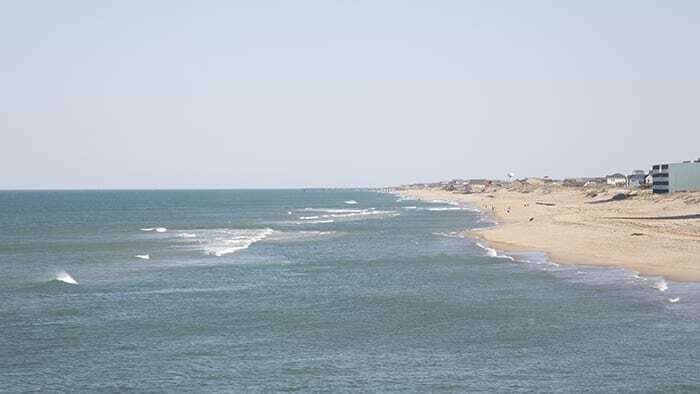 From local projects with Ruthie’s Kitchen and fund raising with our children, we have both had our hand in giving back to the Outer Banks community where we can. We’ve worked on projects with Dream Big Honduras to bring water filtration systems to a small village in Honduras through a grant with the Kitty Hawk Rotary Club. There’s something about lifting others up that brings my husband and I closer together. It’s funny how giving and receiving help can strengthen any relationship if you allow it. This weekend was an easy weekend to find someone to help. 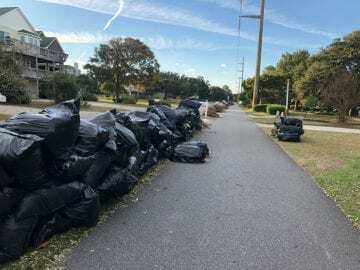 While the Outer Banks didn’t experience Hurricane Michael as a direct hit, we ended up with a back wind that drastically affected homes near the sound and the canals. While the wind was keeping us up late on Thursday evening, the Facebook hysteria was what kept us up through the morning. We sat up in disbelief as our friends and neighbors were losing their vehicles and parts of their homes while trying to put together a plan for helping them. Post after post on Facebook was sharing how flood water rushed in at lightning speed, filling homes with water and flooding cars and storage sheds all over the beach. Business owners were rushing to their spaces to try to salvage anything that they could and we felt helpless as our own road flooded. But like so many storms, the beauty comes within minutes of the cease. I’m not talking about a rainbow, I’m talking about the outpouring of love and the community effort of putting our neighbors back together. I’d love to share with you a story about one kind-hearted local man, Nathan Lawrenson, who took his Saturday and spent 12 hours helping out with a truck and trailer. Through our small town grapevine I heard stories of how Nathan helped both those that he knew and complete strangers, all while smiling and lifting spirits along the way. The goodness of this community doesn’t stop with Nathan. 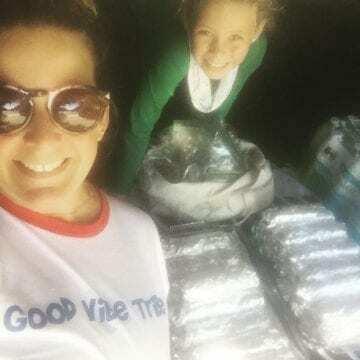 An amazing local mom, Amanda McDanel and her big-hearted daughter set out with 45 burritos and 100 cookies to give to locals who were in complete recovery mode from Hurricane Michael. Amanda used this experience to teach her young daughter, Harbor, how to be the good in the world. If you’ve ever met this family then you know that they truly know how to love and share what they have with others. Amanda’s effort to teach her daughter a valuable life lesson bodes really well for the future of the Outer Banks. Through all of the flooding and all of the stress that this storm brought us, people are still seeing the beauty. Take Nikki Jensen. She and her family lost so much to the flood waters. Nikki and her family have worked all weekend long to put their home back together after being blind-sided by this storm. I honestly think that Nikki said it best when she posted to her personal Facebook account on Sunday. “We rally around and support each other and GIVE BIG! It’s strange to be on the receiving end of it, thank you all. Its hard to describe what this little sandbar is like to people that don’t live here. It’s not the same in cities, we joke that we live where you vacation, but we work hard and we know how to relax and enjoy each other completely and not rat race everyday and instead go let the Ocean calm our souls. 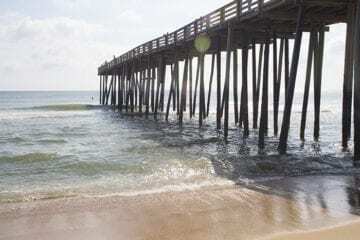 If you have ever asked the question, “What’s it like to live on the Outer Banks?” Well, Nikki just answered that one for you. Just when you thought we had an incredible community, the Outer Banks grew even stronger after working together to help our neighbors and local businesses. Witnessing the outpouring of love and lending a hand this weekend has truly reminded me of the big heart that our community has. I can only hope that the Florida communities that have been devastated by this storm are as fortunate as we are here on the Outer Banks. There truly isn’t anything more beautiful than seeing how helping others can unify people. Forget about our cotton candy skies, glittering ocean water in the morning or the perfect beach day. This display of community love is when the Outer Banks looks the most beautiful to me. Bravo my friend! Beautifully written and ditto everything above.